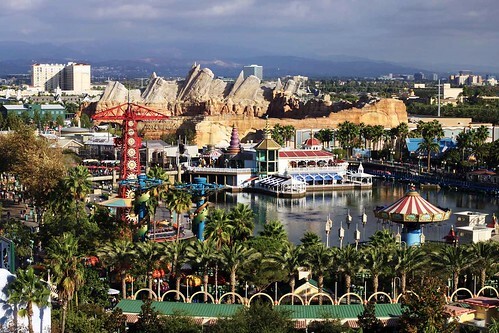 I think I will start with photos of the view from our 11th floor room at the Paradise Pier Hotel at Disneyland California. We stayed the first night there, then moved to the Grand Californian for the next two nights. I added this first night at a later date and the room rates had gone up, so we decided it would be best to save a little money while trying out two of the hotels. Both hotels were fabulous in their own way. 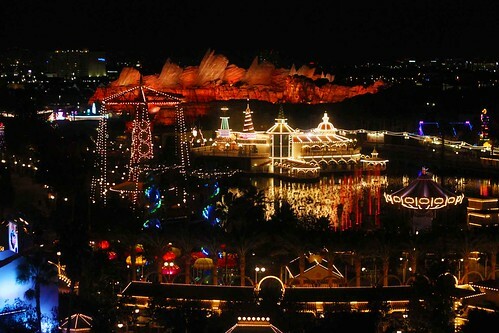 I was awed by the view of California Adventure Park at the Paradise Pier, especially the ever changing colors all night long. This nighttime photo was difficult to shoot because we didn’t have a tripod, so I had to hold the camera very steady. A flash would have bounced off the glass. This is the clearest one, but the others capture the changing colors. It is nice just taking photos sometimes, even if they do not all turn out well. We had beautiful weather for our entire stay. The skies were so blue and clear. 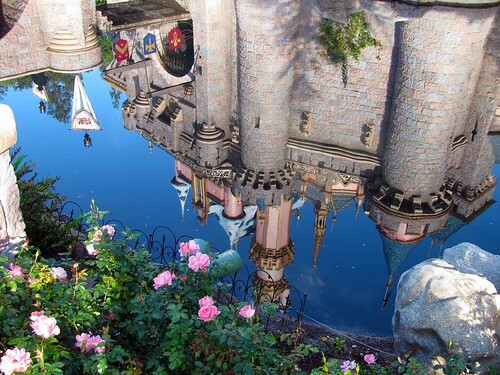 Rick took this photo of the castle reflection in the water. We played around and took lots of these photos. This was the best one. I didn’t have the right lens on my camera, so the ones I thought looked good didn’t in actuality. I am still in the midst of a major life overhaul. I am doing better in relation to exercising daily, mostly, and eating an anti-inflammatory diet. It has taken a long time to adjust. I am finding the cues that trigger my bad habits, and trying out new cues to encourage the habits I want to keep. That is one reason I haven’t been blogging. It just takes so much time and thought to change. I am going to get back into craft blogging. I love sewing on Belle, the Bernina 830 I named after the Disney Princess. I really need to share some of things possible on a sewing computer. It is an amazing machine, almost as magical as Disneyland. This entry was posted on Wednesday, November 14th, 2012 at 2:33 pm and is filed under Disneyland and Life. Tagged: california adventure park, Disneyland. You can feed this entry. You can leave a response, or trackback from your own site. A true fantasy vacation! Love the reflection of the castle in the water – so beautifully clear & crisp. Have fun with Belle – looking forward to seeing more if what you can do together!